Polycarbonate water bottle were standard in the outdoors for years. Then came a chemical scare around 2005 with the knowledge that a potentially harmful compound called bisphenol-A, or BPA, was present in the plastic. Next, metal bottles came onto the scene. Stainless steel vessels from a slew of manufacturers became default for hikers and backpackers and everyday drinkers looking for a “pure” water-toting solution. This year, glass is in the spotlight. The perceived clean sweep of silica as a bottle material is being marketed by niche outfits as well as major players like CamelBak Products. Reusable glass vessels — not throw-away or recyclable bottles — offer a clean look and a material that can keep water fresh. They are easy to sanitize in a dishwasher or by hand in a sink. Another protective concept, CamelBak adds a removable silicone sleeve on its Eddy Glass bottle, which comes to market next month. The sleeve gives grip and a thin, bump-absorbing cover. CamelBak will sell the 25-ounce capacity bottle for $25 when it comes to market next month. Its glass is durable — think milk jug versus a drinking glass, but not as heavy. They are made in a French factory that’s one of the world’s largest producers of glass food containers, the company cites. Another option, PURE Glass Bottle is a brand based in Baltimore. Its reusable bottles are made of glass but with a protective clear shell that “encapsulates the glass and prevents messes and injuries from breakage,” as the company puts it. 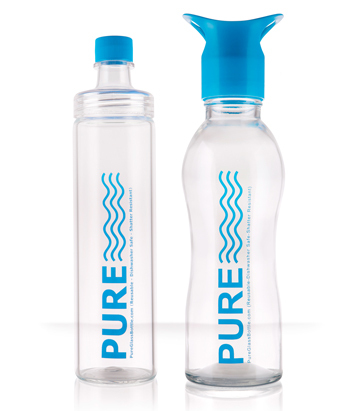 The exterior of the PURE bottle is coated in a smooth polycarbonate-like material. You can’t see it — the bottle just looks like pure glass — but you can feel it there. The coating has a bit of grip to it so that with sweaty hands it’s easier to grab. The company sells two bottle types, both starting at about $20 on pureglassbottle.com. 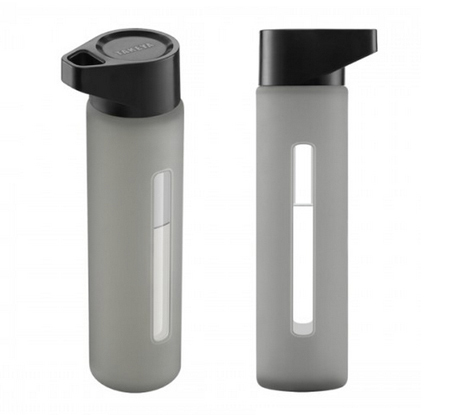 Like CamelBak, Takeya uses a silicone sleeve on its Modern Glass Water Bottle, a 16-ounce vessel. It has a plastic lid that screws on. You can see the water level inside the bottle through a slit in the protection cover. The Takeya bottles come in a few colors and cost $17.99. Like all of the bottles in this review, these are not “performance” outdoor or fitness products — you would not use them cycling or backpacking, though on a hike they could work fine. Finally, Bamboo Bottle Company offers a different glass option. The company’s modular design includes a glass inner bottle, screw-on caps, and a bamboo cover. It is likely the most durable of the glass bottles in this story. A sleeve made of bamboo slips on to offer a protective cover. It secures in place once you screw on a plastic nut, which clamps the bamboo sleeve down. Bamboo Bottles have 17 ounces of liquid capacity and cost about $20. A removable plastic lid threads onto the glass top. You unscrew it to access the liquid inside and drink, an ostensibly clean pour coming from the glass container, cool and pure, straight into your mouth.